Candidates those who are going to appear CMAT Entrance Exam is an online computer-based exam that will be held on January 27 and 28, 2018, have to take the AICTE CMAT Call Letter 2018. Authority will conduct the online test as per the given schedule. The candidates can download their CMAT admit card 2018-2019 till January 20, 2018. 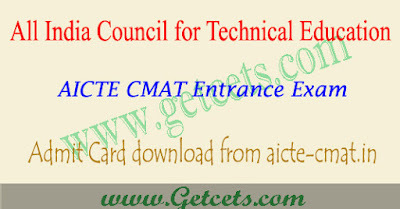 The CMAT entrance exam will have four sections and total questions is 100 duration of exam time 3 hours. After the exam is concluded, AICTE releases All India Merit List and State Merit List. The CMAT exam will be conducted in 75 major cities across the India. The CMAT Results 2018 is expected to be released in February 2018. AICTE has released list of centers Dehradun, Delhi, Dhanbad, Dharwad, Durgapur. Jabalpur, Chennai, Coimbatore. Jaipur, Jammu, Jamshedpur, Jodhpur. Kanpur, Kochi, Kolhapur, Kozhikode. Allahabad, Amravati, Amritsar, Aurangabad, Bangalore, Bareilly, Bhavnagar, Gulbarga, Gurgaon, Guwahati, Gwalior. Hyderabad, Indore, Bhopal, Bhubaneswar, Bhuj, Chandigarh. Davangere,Lucknow, Ludhiana, Mangalore, Meerut, Mumbai, Mysore, Nagpur, Nasik, Agartala, Ahmedabad, Ahmednagar, Navi Mumbai. Noida, Panaji, Patna, Pune, Raipur, Rajkot, Ranchi, Shimla, Srinagar, Surat, Trivandrum, Udaipur, Vadodara, Varanasi, Visakhapatnam. Frankly ask us by comments and share this CMAT admit card 2018-2019 download released by AICTE article with friends on social media for appreciation for us and we may again continue for the AICTE CMAT admit card 2019-2020 download and AICTE CMAT Results 2018. Click on the ‘Download Admit Card’ link on the home page. 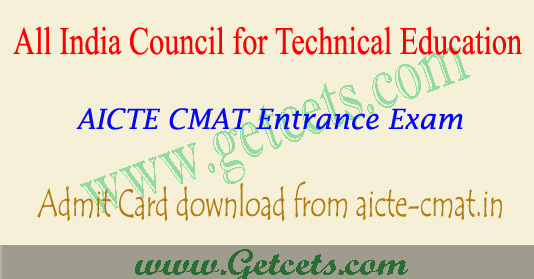 Click on submit and download the AICTE CMAT admit card 2018.